Back in the early 80s, there was a saying that gained tremendous popularity in computing circles. Today, we would call it a meme. “Print is dead.” It was so popular that it was even used as a joke in Ghostbusters. Back then, the concepts of the paperless office and electronic mail was just starting to pick up steam. Of course, we know now that it wouldn’t be until the mid-90s that email would really take off, and decades until the paperless office became a reality. So, here is the question: now that digital technology has reached the point where we literally have supercomputers in our pockets (by the standards of the 80s), is print finally dead? 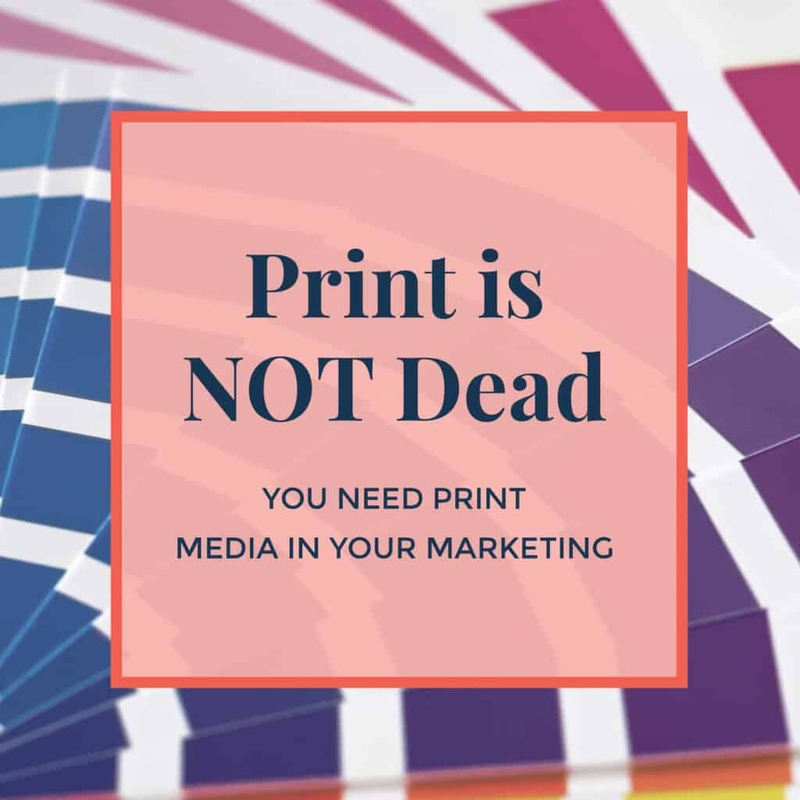 Is print dead? Not even close! Learn how print media can help boost your marketing! All you need to do is look around to see just how effective physical marketing can be. There are countless posters for movies and concerts plastered on walls all over America. There are full-page, eye-catching ads in newspapers. Business cards are as popular as ever. And if you want to see where the world of print and digital marketing collide, check out the prevalence of QR codes plastered everywhere. But why would companies spent this kind of money on print marketing when digital marketing can be so much cheaper? Easy. Engagement. Do you want to know one of the best ways to put a face to a name? A business card. When someone hands you their business card, they are creating a real, tangible connection between you. It’s an incredibly effective method of reaching out to your customers in a way that they will remember. A great business card shouldn’t just have your name. It should be beautifully designed with your branding infusing every part of it. Your name and logo should be there, along with your title and contact information. If you want to double down on getting your face out there, putting a photo of yourself on your business card can be a great idea. Be sure you invest in a professional photo and not just a selfie you take on your phone! And if you need someone to put all these parts together, just ask a virtual assistant! The thing about the internet is that everything moves at an incredible pace. Search algorithms and SEO are continually updated, ads are quickly buried under other, newer ads. Facebook and Twitter posts vanish into the newsfeed before you know it. Digital media offers you an incredible reach, but you always need to be on top of it for it to be effective. (And if you find yourself frustrated by it, I would suggest giving digital marketing a second chance). Let’s contrast that with physical media, such as these two popular pieces of branded collateral. If you give your customers a fridge magnet branded with your company’s logo, guess where it will be going the second they return home? The fridge! From that point forever, every time they open their fridge, they are going to see your logo. In their own home. And chances are that magnet is going to remain on the refrigerator for, not just a day or two like digital ads, but MONTHS. Even years! Pens are another great form of physical marketing media. Do you ever feel like there is never a pen around when you need one? If you give your customers pens branded with your logo and company name, they will likely end up in their drawers, ready to be found the next time they are searching for a pen. Not only are these two pieces of physical marketing long-lasting, but they are also useful to the customer. When they need a pen or are looking for a magnet to stick something to the fridge, it’s your small business that is coming to the rescue! The death of print has been greatly exaggerated! Find out how you can use it in your marketing campaigns! If any of your products are physical, then you need to pay attention to the way they are packaged. There’s a reason why unboxing videos are so popular on YouTube. The excitement that you felt as a kid on Christmas morning never really goes away as an adult. Opening up an Apple or Microsoft product is an exciting part of the overall experience, and the packaging plays a huge role in that. If you are packaging your products in beautifully-designed boxes, then you’re going to be adding an extra layer of excitement for your clients to enjoy. The key, of course, is that it needs to be appropriately branded, with awesome graphic design and engaging product copy. By the way, this goes for virtual products too (ebooks, courses, free downloads etc.) should all be branded and beautiful! And those are both great jobs for a virtual assistant! Of course, the print marketing world often maps onto the digital marketing world. Take blogs for example. Twenty years ago, what we consider to be a blog would have just been considered a short magazine article. But the principles of writing have never really changed. If you want to boost your blog/article writing abilities, I invite you to download my free Blog Breakdown Workbook. I breakdown the structure of a blog into its component parts, helping you see how to put one together. If you want to up your blog game, this free download is a must! There are many digital marketers out there who look down on print marketing. Not me! I think that an effective mix of physical and digital media can make the difference between a “blah” marketing campaign and a “Wow” one. If you’d like to talk about putting together a marketing campaign, and the role that physical media could play in it, I invite you to contact me today! Also, you can check out some of my favorite print marketing we have created here. Do you have a comprehensive business plan? GRAB MY FREE WORKBOOK: Write your own detailed business plan with checklists, milestones, and measurable goals in 8 easy steps! Yes! Please send the business planner!